The SMARTRAIL vision is to provide a framework for infrastructure operators to ensure the safe, reliable and efficient operation of ageing European railway networks. This will be achieved through a holistic approach which will consider input from state of the art inspection, assessment and remediation techniques and use this data to consider “what if” scenarios using whole life cycle cost models. These models will allow the infrastructure operators to make rational decisions on the best use of limited funding which will be committed to the long-term maintenance of the rail infrastructure networks. 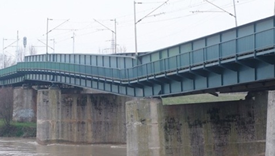 The outputs from the project will result in enhanced safety, reliability and capacity of these rail infrastructure networks and address European policy in the areas of transport safety and security, inter-modality, opening up a European network for freight transport and routes to rapidly developing Eastern European and Asian markets. Safe and efficient transport infrastructure is a fundamental requirement to facilitate and encourage the movement of goods and people throughout the European Union. There is approximately 215,400 km of rail lines in the EU which represent a significant asset. Many of the rail networks in Eastern Europe and in parts of Western Europe were developed more than 150 years ago. These networks were not built to conform to modern standards and suffer from low levels of investment and in some cases poor maintenance strategies. Replacement costs for civil engineering infrastructure items such as rail track, bridges and tunnels are prohibitive. In the current economic climate it is vital that we maintain and develop our transport network and optimize the use of all resources. It is essential therefore those methods used to analyse and monitor the existing infrastructure result in realistic scientific assessments of safety which allow the effective programming of remedial works. This SMARTRAIL project aims to bring together experts in the fields of rail and road transport infrastructure to develop state of the art inspection; monitoring and assessment techniques which will allow rail operators manage ageing infrastructure networks in a cost-effective and environmentally friendly manner.